Why don't hall effect current sensors exist for low currents? There do not seem to be hall effect current senors available for small currents, say on the order of 500mA. I'm guessing this is due to some technical or physical limitation. What is it? Hall effect current sensors measure the magnetic flux generated around a conductor carrying current. As such, the sensitivity is limited by the noise floor due to extraneous magnetic "noise" in the vicinity of the conductor. This can be overcome to varying degrees by concentrating the magnetic flux due to the current carrying conductor, by a fairly simple means: Pass the current to be measured through a coil surrounding the hall effect sensor. Low currents can be measured with the MLX91206 by increasing the magnetic field via a coil around the sensor. The sensitivity (output voltage vs. current in coil) of the measurement will depend on the size of coil and number of turns. Additional sensitivity and increased immunity to external fields can be gained by adding a shield around the coil. 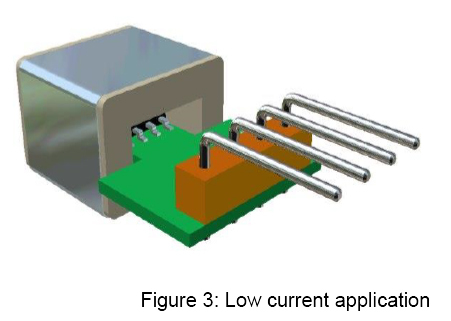 The bobbin provides very high dielectric isolation making this a suitable solution for high voltage power supplies with relative low currents. The output should be scaled to obtain the maximum voltage for the highest current to be measured in order to obtain the best accuracy and resolution. In practice, so long as the design can tolerate an inductance in the current path, the MLX91206 works well enough down to 100 mA current for full-scale output. When measuring supply rail current, this can actually be leveraged to added advantage by using the inductance for ripple suppression, "for free". Conjecture: It might be worth exploring whether a non-rectangular (toroidal) coil provides better extraneous magnetic noise attenuation than the rectangular form - perhaps even lower currents can then be measured. Where \$I\$ is the current supplied to the sensing plate, \$B\$ is the magnetic field you're sensing, \$t\$ is the thickness of the plate, \$e\$ is the elementary charge, and \$n\$ is the charge carrier density of the carrier electrons. Just to get an idea of the magnitude, in the case you describe, 500mA, at a distance of 1cm the B field would be about 10 \$\mu\$T (micro Teslas). There are two things we can mess with at this point to get a voltage above the noise floor. We can increase the supply current or we can decrease the thickness of the sensing plate. Clearly there are practical limits to increasing current and hard limitation to decreasing the thickness of the plate. The two options also oppose one another, decreasing the thickness increases resistance which will generate more heat for higher currents. It seems likely then that measuring very small currents would be simple with very expensive equipment. I seem to recall that particle accelerators do this with near absolute zero chilled superconductors, but I can't find evidence of that right now. Not the answer you're looking for? Browse other questions tagged current-measurement hall-effect or ask your own question. current sensor for small currents? Does placement (high side vs low side) of a hall effect sensor matter? Current Monitoring - CT vs Hall Effect vs Rogowski Coil?